Nike’s marketing pitch: Versatile and fast. Upper: Engineered mesh, partial inner sleeve, Flywire strap-based lacing. Midsole: Compression molded EVA foam midsole, heel and forefoot Zoom Air bags. 10 mm heel drop. Outsole: Full-length hard carbon rubber. 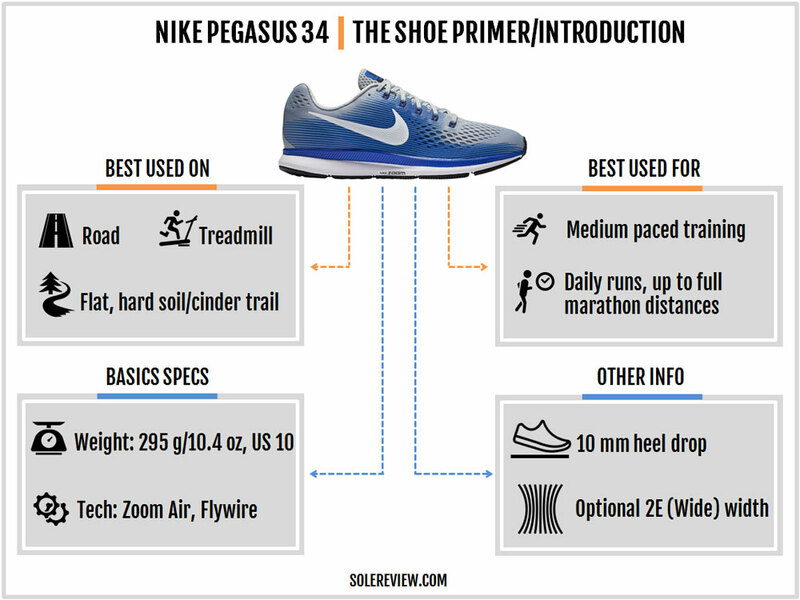 The Pegasus 34 is very similar to the 33. The ride quality is exactly the same while upper receives a few updates. The value proposition - that of a durable and comfortable everyday trainer - stays unchanged. The Nike Pegasus is, by far, the longest continuing running shoe series (excluding retro releases) in the history of the footwear industry. The ’34’ suffix to the shoe name is a testimony to how long the Pegasus has been around. It won’t be far fetched to say that the Pegasus is nearly as old as Nike itself. So what makes the Pegasus so special? But that’s asking the wrong question. The Pegasus isn’t special in any way, and that’s perhaps its greatest strength. The Pegasus is the footwear equivalent of the boy or girl next door – not the smartest or the most athletic, but someone you’re comfortable hanging around with all day. This decently priced, neutral cushioned trainer by Nike fits that analogy. There’s cushioning, and yet it’s not ultra soft. The upper fits well without cocooning your feet in material plushness. The Zoom Air bags provide a snappy feel under the forefoot and rear, and the outsole is as durable as they come. In other words, the Pegasus 34’s lack of special is what makes it endearing to so many. 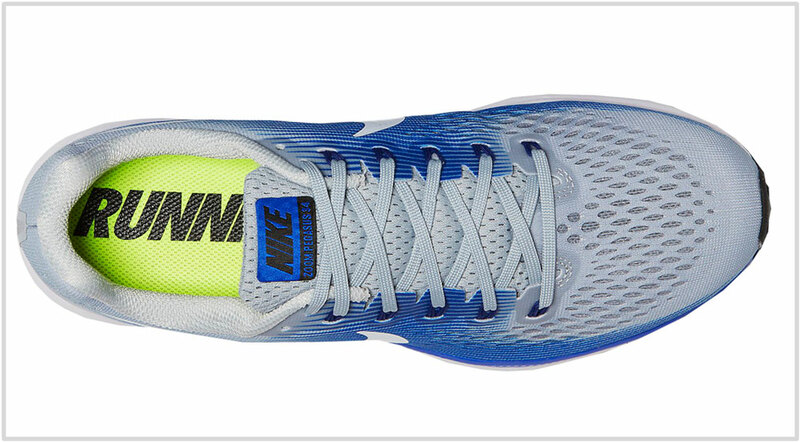 The same can’t be said for the Structure, the Nike Pegasus’s stability counterpart. The Nike Structure has gone through many changes with all the enthusiasm of a swinging pendulum. Some versions worked well, while others were flawed. But then, that’s a story for another time. So for now, we’ll stay on topic. If you’re a long-time Nike user, then you would be familiar with Nike’s biennial design update cadence. For most Nike running shoes, midsole and outsole changes happen once in two years while the upper changes annually. The Pegasus 33 updated the midsole and outsole, so this year it’s time for an upper-only refresh. 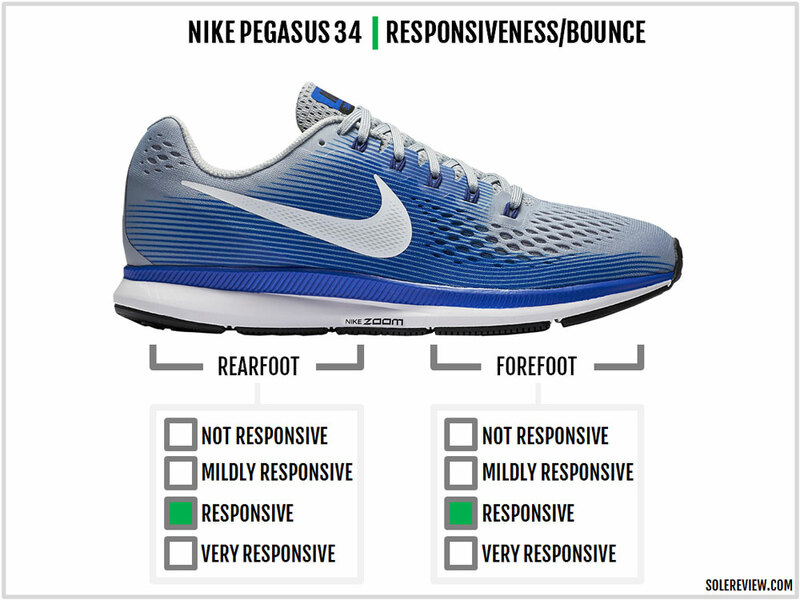 Not much has changed since the Pegasus 33. The midsole and outsole stay the same, and all updates happen on the Pegasus 34’s new upper. The upper changes aren’t major and just happen to be tiny tweaks made to the material and construction. 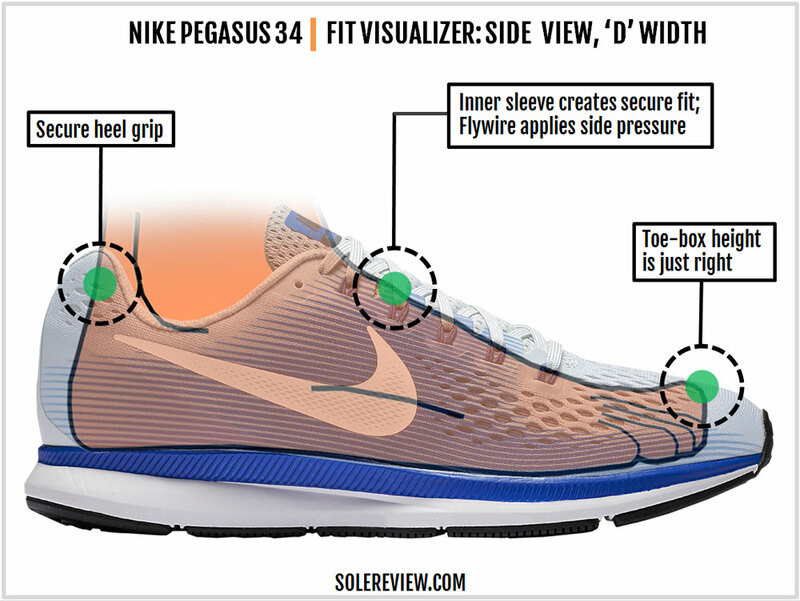 The important update is the Pegasus 34’s upper fit – it is narrower than the 33 due to the revised positioning of the Flywire cords. 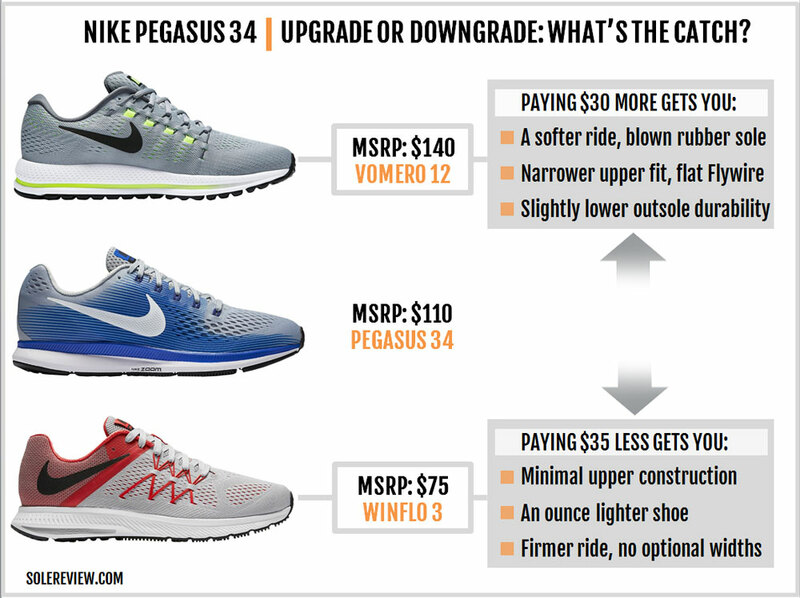 So if you’re not in a mood to pay new-shoe dollars for the Pegasus 34, it’s perfectly ok to stay with the 33 for another year. This way, you can save plenty of money by getting the outgoing Pegasus 33. That would be a financially prudent decision, as the differences between the 33 and 34 do not amount to much. While the Pegasus 34’s upper bears a close resemblance to the previous designs, efforts have been made to align the aesthetic scheme with Nike’s ‘Breaking 2’ collection. The Pegasus 34 is inspired by the clean lines of the Vaporfly 4% and the Zoom Fly. This inspiration also extends to the large vents on the Pegasus 34’s engineered mesh upper and the ‘speed lines’ running over the side. The Flywire cords are now concealed by the first layer of the engineered mesh, which is a contrast to the exposed design of the Pegasus 33’s Flywire cords. Hiding the Flywire now allows the 34 to move the Swoosh logo to a more prominent location over the center. The basic upper construction is similar to the last few Pegasus versions. A single piece of mesh wraps around the entirety of the shoe, with another internal layer forming the half-sleeve attached to the tongue. In the rear, there’s a hard internal counter and the toe area has a pliable stiffener. No change can be observed on the tongue and collar lining. The tongue is sparsely padded as always, and the collar uses a soft textile with a foam fill inside. 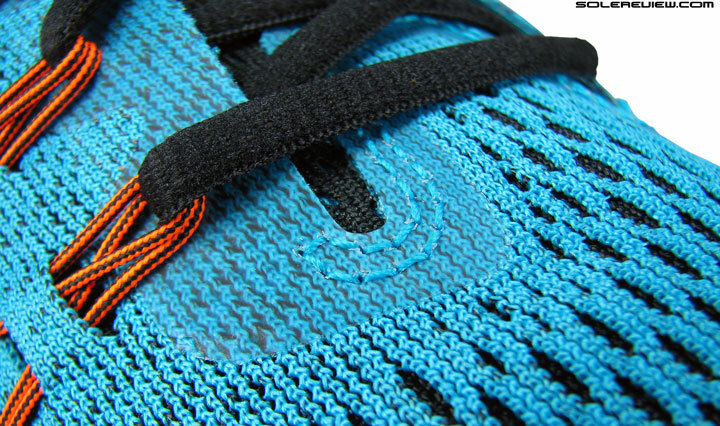 The last two lacing rows are non-Flywire, and the reserve row can be used for heel-lock lacing when called upon. What’s new on the Pegasus 34’s upper is the engineered mesh with larger-than-before vents. Compared to the past few models, the forefoot has bigger pores which allow improved splay and ventilation. And while it is difficult to see from the outside, the internal toe-bumper appears to have gained height too. Also new are the flat laces and the external heel design. The Pegasus finally switches to flat laces with a minute amount of stretch in them, which is a much-needed improvement over the round laces of the past models. We say this because the flat laces do a better job of distributing top-down pressure and stay tied-down longer too. The counter gets additional urethane reinforcement over the sides and back. The sides are now covered in a transparent laminate (same as what’s used on the lacing area), and the heel center has a thicker urethane with reflective strips over it. 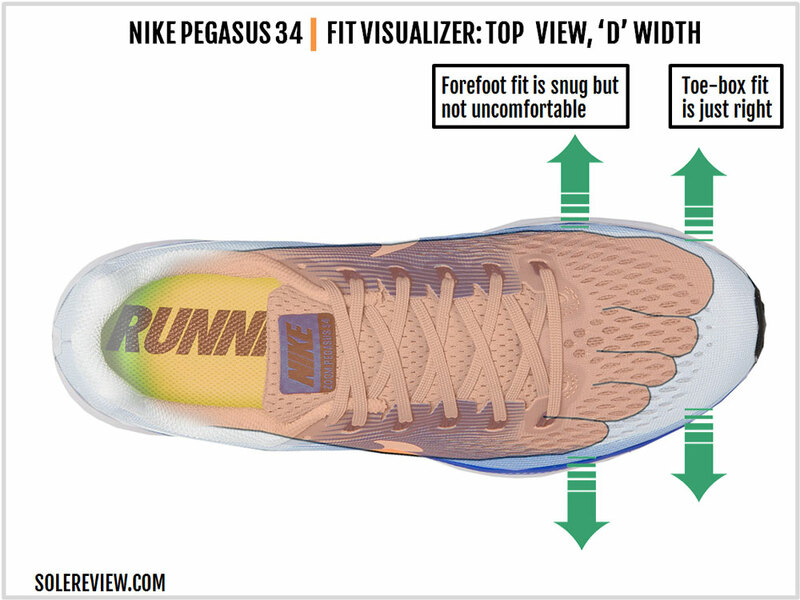 This is one area where the Pegasus 34 is shortchanged; the level of reflectivity is lower than the 33. True to its once-in-two-years midsole design update cycle, the Pegasus 34 carries forward the same sole design from the 33 (which had a brand new sole unit). The Pegasus 33 introduced an additional Zoom Air bag under the forefoot last year, and that continues to be the case for the 34 too. Nike’s EVA foam – Cushlon – forms the bulk of the 10 mm drop, single-density foam midsole, with Zoom Air bags embedded in individual heel and forefoot cavities. Unlike shoes such as the Vomero, the EVA used isn’t very soft and is tinged with firmness. Outsole coverage is plentiful. Except for a portion of exposed midsole foam under the heel, the bottom is generously overlaid with durable and grippy rubber. The outer side has a series of ‘crash rail’ – pairs of rubber strips – for smoother transitions. Not all hard Carbon rubber types are the same; the compound used in some brands last longer than the others. 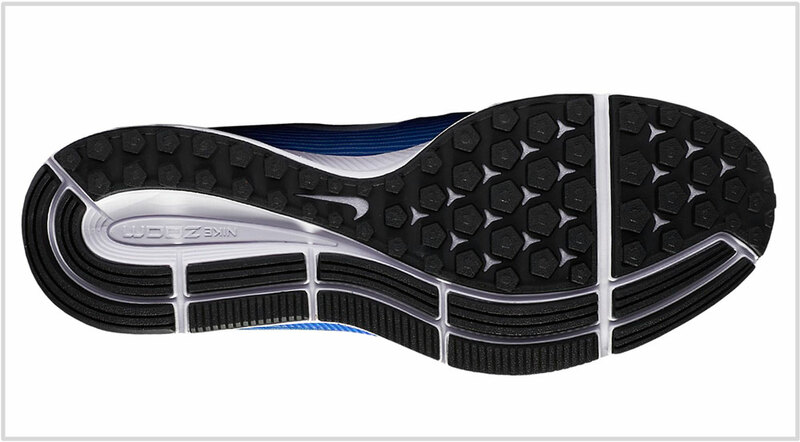 Nike’s formulation for its outsole rubber hits the sweet spot between delivering traction and durability. We’ve rarely come across complaints about the Pegasus’s sole, and that’s because they usually last very long. You should be able to extract more than 400 miles with the Pegasus. Wear and tear will happen with the foam midsole and insole, though the Zoom Air bags will retain their cushioning as long as they do not accidentally deflate. The double-layered upper is durable as ever, so it’s unlikely that it will fail before the midsole. 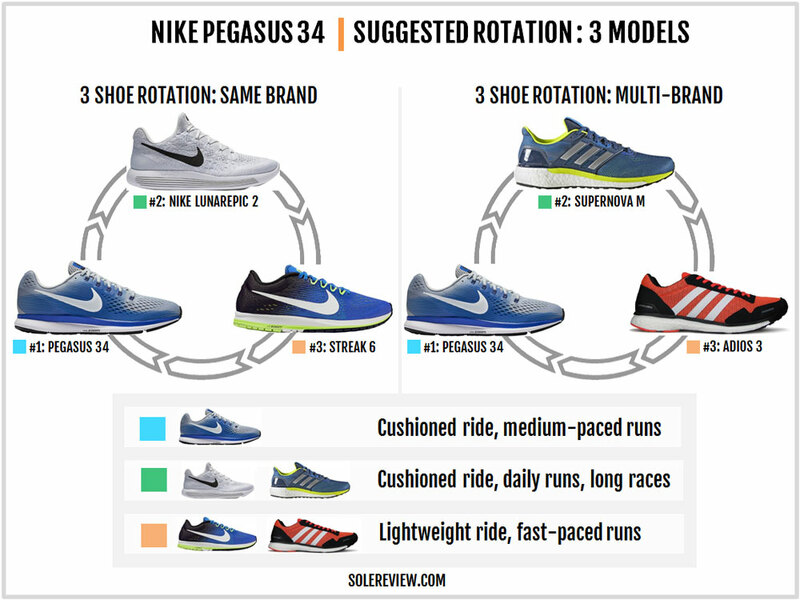 The Pegasus switched to a slim fit after the version 30, and the 34 is similar in many ways to the 31, 32, and 33. That said, there are a few welcome updates to the fit. As mentioned previously, the flat laces do a far better job of sitting flush over the thinly padded tongue. 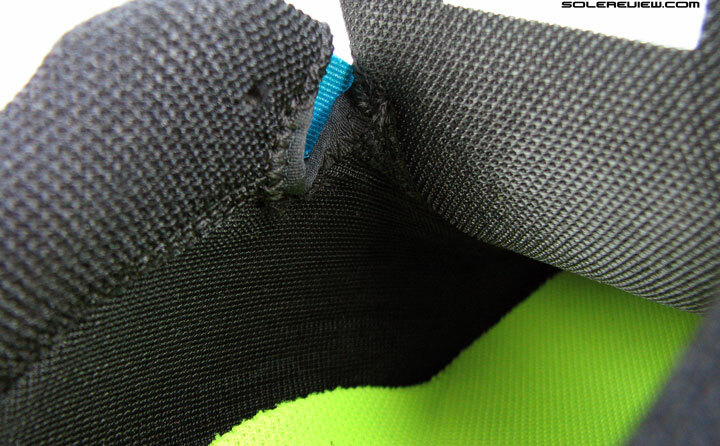 The new mesh material has larger vents, so there’s a bit of extra splay room on the sides. Not saying that the Pegasus 33 was narrow, but the 34 just relaxes the sideways fit ever so slightly. As a bonus, the Pegasus 34 is more breathable than the 33. We could be wrong, but the toe-box height also feels higher. It is our guess that the internal toe-stiffener is raised over the 33, freeing up a bit of vertical room. In the back, the heel fits and feels the same, with the overall heel-to-toe sizing being true. Moving most of the Flywire between the upper layers also means that the cords are closer to the foot. This change is something you can sense, as the thin cords strain against the foot when laced tight. The heel provides a secure grip. The internal heel counter delivers the required support, and the padded collar wraps the foot without slippage. If you’re expecting the Pegasus 34 to be a soft shoe, then you’ll be disappointed. The Pegasus 33 and 34 are firmer even by version 31 and 32 standards, and that’s because of the extra Zoom Air bag added to the forefoot last year. The only layer of perceivable softness is provided by the removable insole and the foam lasting below it. The foam cavity under the heel also splays when loaded, and adds to the cushioning experience. 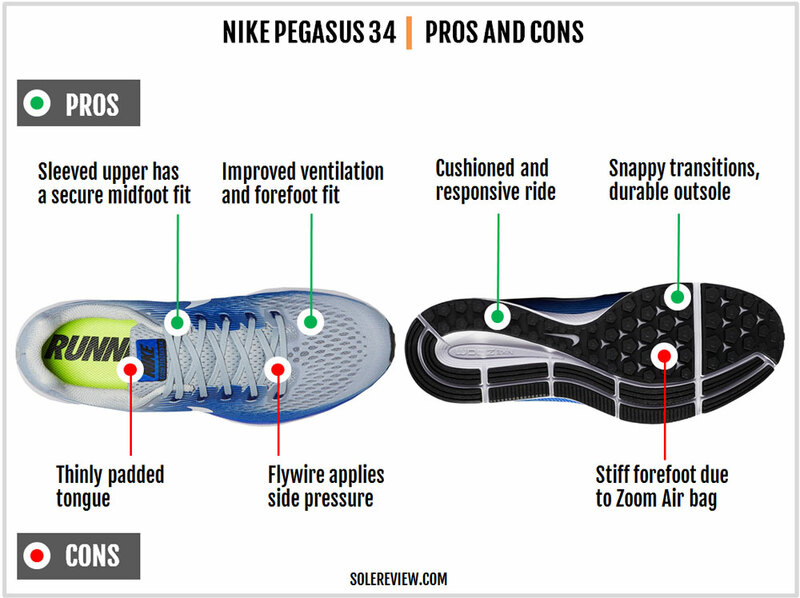 Most runners would describe the Pegasus as a stiff shoe, and that’s not far away from the truth. The Zoom Air bags add a high degree of responsiveness, but the trade-off is the loss of softness, especially at lower speeds. At a higher pace (faster than 5 min/km), the Zoom Air bags add plenty of springy feedback to the ride, regardless of whether you’re a forefoot or heel striker. The firmness and relatively inflexible forefoot contributes to the transition quality. 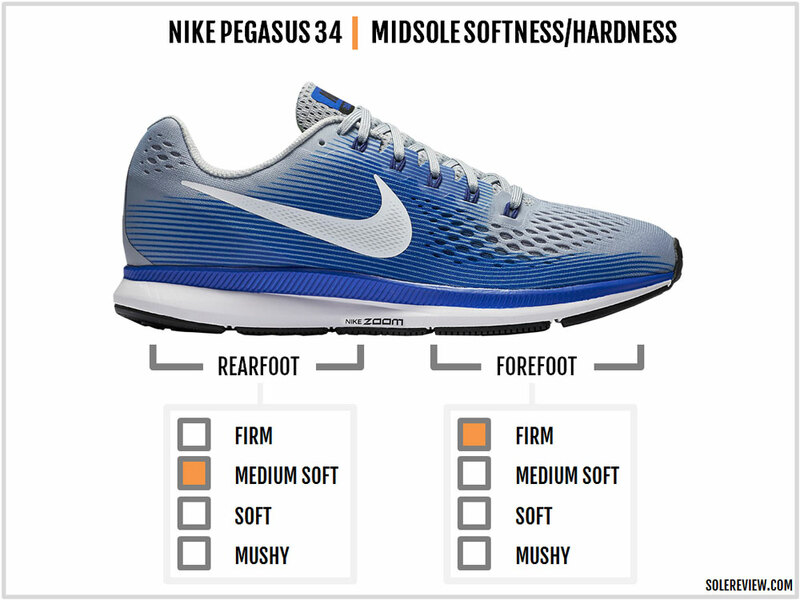 Push-offs feel quick on the Pegasus 34 (and 33), a trait which adds to the Pegasus 34’s versatile nature. The combination of standard foam and Zoom Air bags packs enough cushioning for gruelling marathons while the snappy feel makes the shoe suitable for shorter runs. The Pegasus is a decently priced, well-rounded package. The Pegasus undercuts most of its competitor by $10 while offering a ride character which combines a healthy dose of cushioning with plenty of springy responsiveness. The upper has a seamless interior and a secure fit, both of which are positive traits on a running shoe. The durable outsole is the icing on the cake. All that said, the Pegasus isn’t perfect. We’re yet to warm up to the idea of the cord-based Flywire which puts localized pressure over the side. This happens more so on the Pegasus 34 which moves the cords closer to the foot. Also, the 34’s heel reflectivity looks snazzier, but there’s less of it when compared to the previous model. 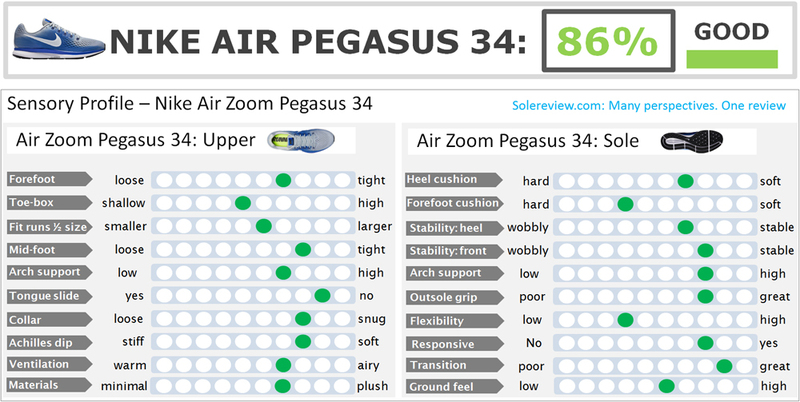 The Pegasus 34 also seems (at the time of writing this review) to have dropped the Extra-wide (4E) version which was previously available on the 33. Why? The ride quality hasn’t changed over last year, so it’s ok if you decide to stick with the Pegasus 33. Both versions are equally versatile, comfortable with taking on long-distance runs as much as shorter bursts. There’s adequate cushioning along the length of the shoe mixed with a snappy feel provided by the Zoom Air bags. All changes take place on the 34’s upper. Here’s a list of the updates: The laces change from round to flat and the new engineered mesh upper is more breathable but slightly narrower. The Flywire cords are now placed closer to the foot (hence the increased tightness), and there’s a reduction in heel reflectivity. 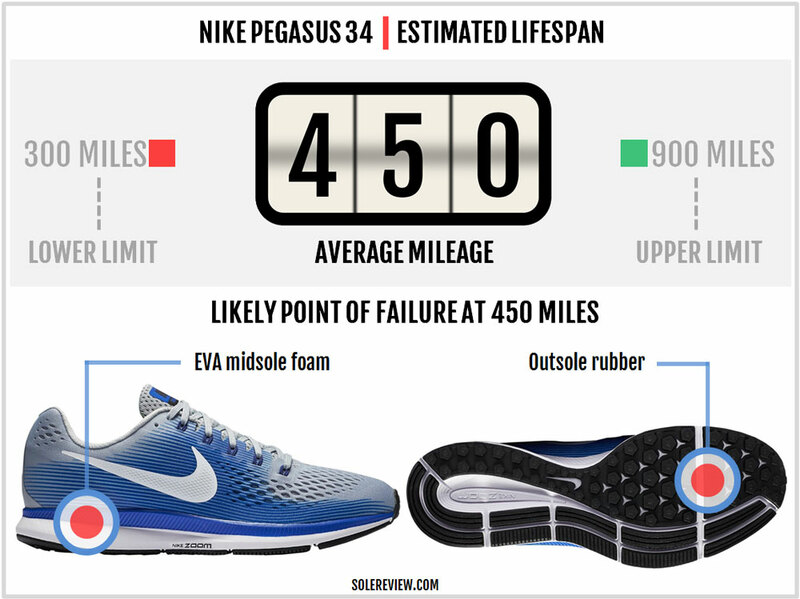 There is a small difference in shoe weight; the Pegasus is 0.4-ounce lighter. With the Nike Pegasus receiving two Zoom Air bags, there’s reduced differentiation between it and the higher-priced Vomero 12. But you’ll still get extra cushioning due to the blown rubber outsole and a slightly softer midsole foam. Keep in mind that the Vomero 12 fits noticeably narrower than the Pegasus 34. 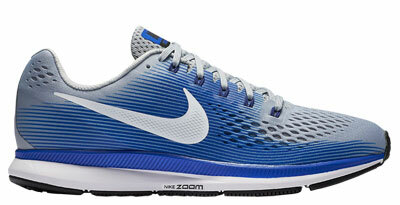 The Zoom Winflo 3 is an entry level neutral shoe with a lightweight build. The use of Flywire and engineered mesh serves as a design tie-in with more expensive Nike models, and a heel-only Zoom provides snappy cushioning for rearfoot strikers. Having the Lunarepic Low 2 along with the Pegasus and Streak 6 makes for a wholesome running shoe assortment. 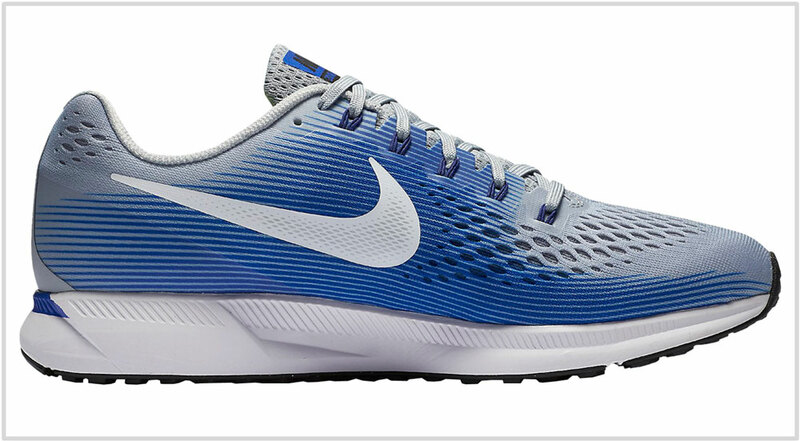 The Lunarepic offers a softer and differentiated ride than the Pegasus, while the Streak 6 is great for fast runs and races up to a half-marathon. Last year, we recommended the adidas Ultra Boost as a more cushioned companion to the Pegasus. That changes this year due to the introduction of the much-softer Supernova. You can rotate the adidas Supernova for the long and easy runs alongside the relatively firmer Pegasus 34. The durable and snappy adidas adios 3 performs best when used for fast-paced runs. Say, races from 5K up to a half marathon. 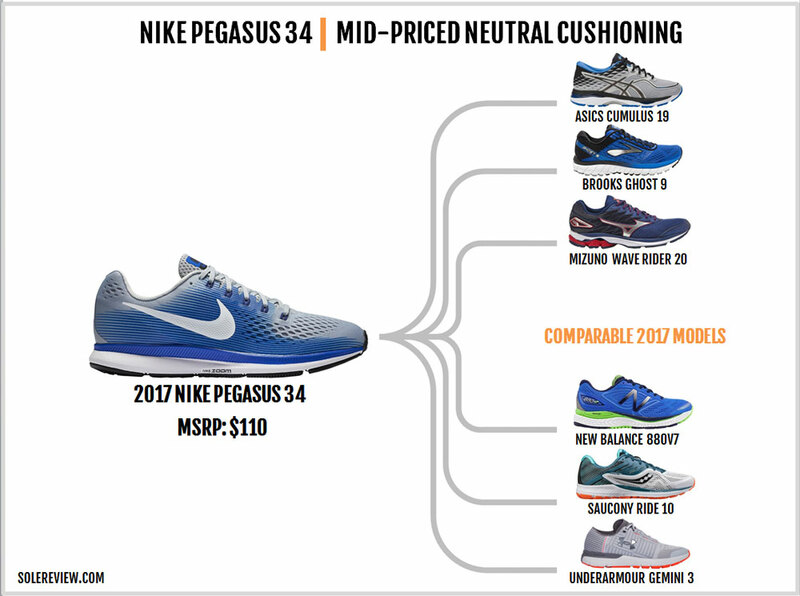 The Pegasus 34 compares to several others in the mid-priced, neutral cushioning class of running shoes. The Saucony Ride 10 is the closest in terms of overall character, and the Underarmour Speedform Gemini 3 is a close second. Both shoes are different in many ways, though. The Ride fits narrower and has a flatter ride quality, and the Underarmour is a firmer shoe with a slimmer upper. Others like the Brooks Ghost 9 provide a cushioned and supportive ride without being noticeably soft or responsive. And there’s the softer riding Asics Cumulus 19 and the New Balance 880V7 with their engineered mesh uppers. Mizuno’s Wave Rider 20 is not cut of the same cloth as the others, thanks to the plastic Wave plate and the firm midsole foam. Nonetheless, a neutral and supportive running shoe it very much is.